Oscar De La Hoya strikes me as a man who doesn’t buy the idea that recognizing power in another doesn’t diminish his own. But that doesn’t change this fact: If either De La Hoya or Richard Schaefer disappeared today, there is little question which one would be better off remaining visible and running Golden Boy Promotions. And it’s not the guy for which the company is named. He might be the majority stockholder and the face by which most still recognize the business, but De La Hoya’s demons opened the door for Schaefer to continue building the brand to an incredibly successful level. It will be a big problem for De La Hoya if he can’t work out those issues that have relegated his relationship with his CEO to emails between attorneys. De La Hoya suggested on Saturday that it might be time to extend Schaefer an olive branch. I would suggest the whole damn tree. De La Hoya met with assembled media before the welterweight unification title bout between Floyd Mayweather Jr. and Marcos Maidana at the MGM Grand Garden, the first time he has formally engaged such a large group since finishing a three-month rehabilitation stint in December for his latest battle against substance abuse. I understand it. De La Hoya is a proud champion. You never lose the ego. It’s his company. His baby. He isn’t happy Schaefer has developed such a close relationship with Mayweather and Al Haymon, the fighter’s manager, that Golden Boy has, in fact, promoted fighters signed under the Haymon umbrella. De La Hoya on Saturday said no one talks for Haymon, which is sort of funny. Haymon doesn’t talk to anyone. The guy is boxing’s most famous mute. Schaefer isn’t happy De La Hoya reached out to his former promoter, Bob Arum of Top Rank, possibly to open the door for the sport’s two biggest promotional companies to again do business together. No one seems happy about much except Mayweather’s accountant. But beyond the mega-fights such as Mayweather-Maidana, beyond the boatloads of money such an evening like Saturday earns Golden Boy, beyond those successful cards featuring the likes of Bernard Hopkins, Schaefer has strengthened the company through its lesser-known fighters. He’s the one those at the MGM and Barclays Center in Brooklyn, N.Y., and StubHub Center in Los Angeles trust the most. He makes the deals. He has the contacts. Schaefer said Saturday he won’t negotiate his issues with De La Hoya through the media but expects everything to be decided within a few weeks. But he also didn’t attend De La Hoya’s news conference, which says all you need to know about where the two stand. “I have nothing against Richard,” De La Hoya said. “But I have to look out for myself and my company. I have my vision and my plans. The company isn’t called Golden Boy for nothing. I have Plan B, C and D.
“You all know what happened to me with (rehab). Bottom line, I wasn’t well. I got caught up in stuff, and I was down and out. But now I have decided to get up and fight for my family and for boxing, a sport I dearly love. You can’t take me out anymore. I’m here. I don’t want to be another statistic. Not me. It would be impossible for De La Hoya to spin a positive outcome that anyone would believe should Schaefer ultimately walk away from Golden Boy. Schaefer won’t work with Arum, and Mayweather won’t work with Golden Boy if Schaefer isn’t part of it. Floyd might just hire Schaefer away himself, which would be a typically intelligent business decision from the Mayweather camp. I’m not sure if Haymon can speak, but I know he makes great deals. 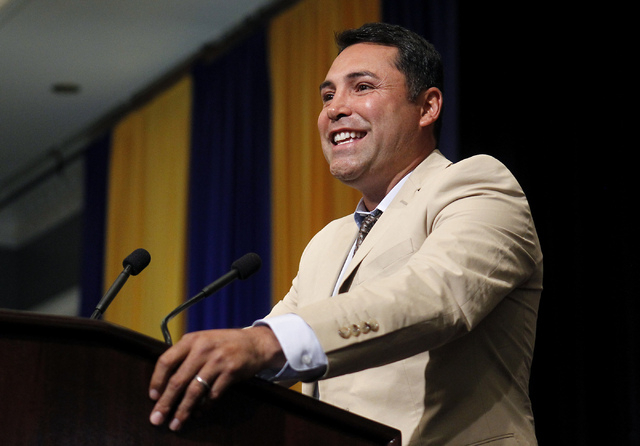 If the Golden Boy split happens, Arum would at least help De La Hoya remain relevant. The two could make good fights. But as commendable as it is for De La Hoya to face those demons and proclaim he will beat them this time, it’s not wrong to suggest Schaefer should arrive at the table lacking much trust in any long-term vision with Golden Boy. I don’t see things working out. De La Hoya and Schaefer reportedly shook hands during undercard action Saturday, but when you have a 25-minute news conference beforehand and spend most of it saying you need to do what is best for yourself, reconciliation doesn’t appear a leading option. And that’s too bad for De La Hoya. If one disappeared today, Golden Boy Promotions would be in better hands with the guy most responsible for the company’s recent storm of success. The CEO and not, well, the Golden Boy.